DataLend—the securities finance market data division of EquiLend, a FINRA-regulated financial services firm—provides aggregated, anonymized, cleansed and standardized securities finance data covering all asset classes, regions and markets globally. DataLend operates on a “give-to-get” model, processing more than 3 million global transactions per day. DataLend’s data set covers more than 50,000 securities on loan with a daily on-loan balance of $2+ trillion and lendable balance of $19 trillion (as of February 2019). 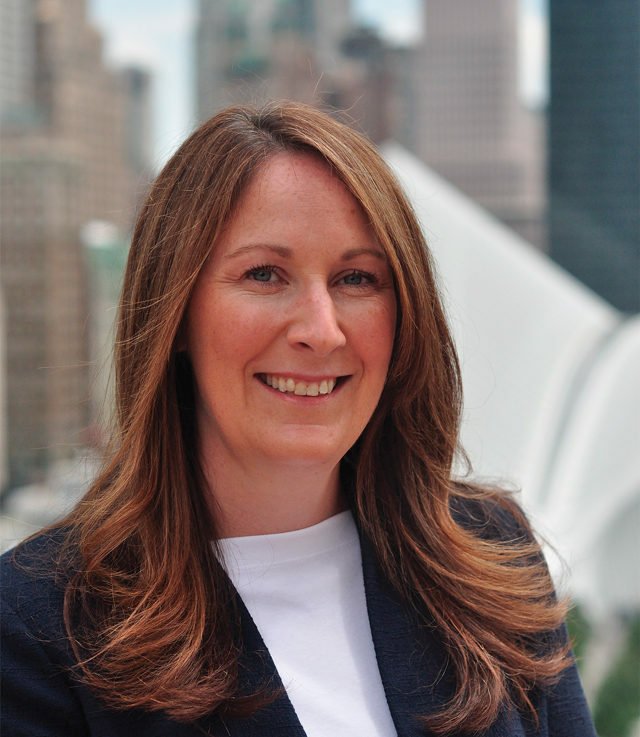 DataLend has offices in New York, London, Hong Kong and Toronto and is backed by 10 global financial institutions: BlackRock, Credit Suisse, Goldman Sachs, J.P. Morgan Clearing, J.P. Morgan Chase, Bank of America Merrill Lynch, Morgan Stanley, Northern Trust, State Street and UBS. Experience robust performance reports with unparalleled insight into your securities lending program. Benefit from standardized performance measurement, flexible but DataLend-controlled peer groups and unique and exclusive data. Optimize your lending program and maximize revenue by making the most informed decisions with DataLend’s CPR. Ensure consistency across performance reviews through the use of DataLend’s standardized peer groups. DataLend’s peer groups are controlled by the DataLend proprietary algorithm. They cannot be manipulated to impact performance. DataLend has access to inventory and loan positions not included in any other securities lending data service. Ensure this data is part of your analysis to obtain the most accurate performance measurement possible. 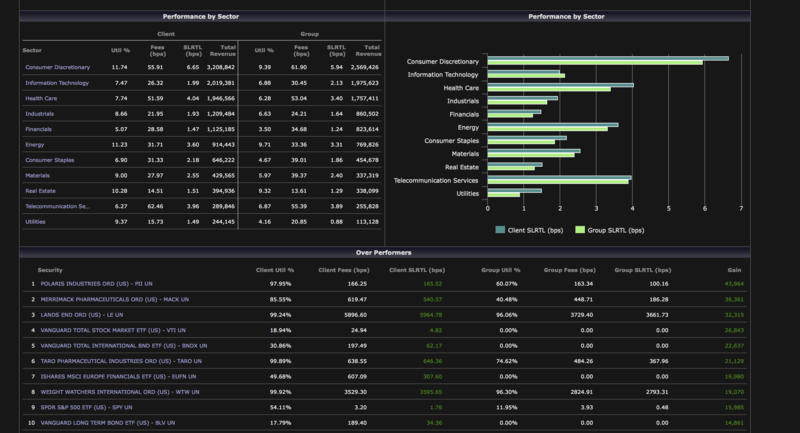 Multi-select by asset class, country and sector over a customized time period and tailored account groups. 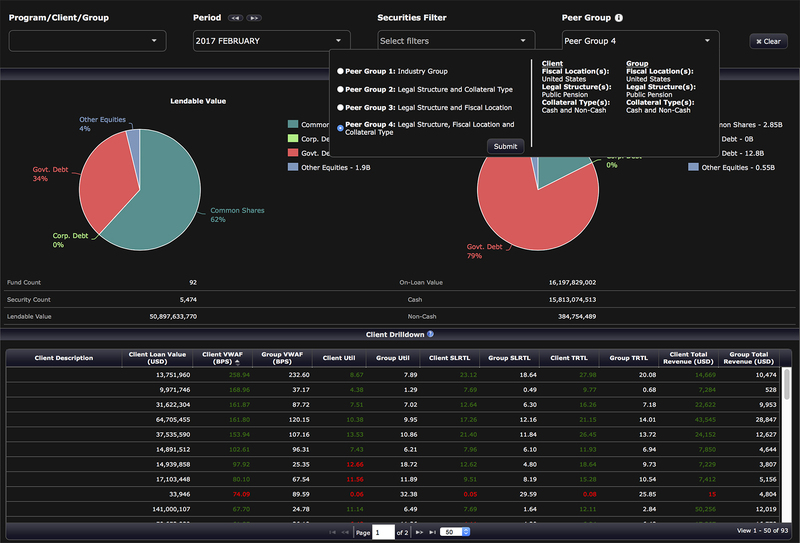 Use the filter options to choose your peer group, timeframe and asset class to see how your portfolio is performing on a relative basis.